Korea has an animation museum. It's the only one in Korea and it's located in Chuncheon. There are various sections, many of which are somehow interactive. There's a section that describes some of the history of animation, sections about the production of the animation process, a section of old Korean comics and more. The section on animation from different regions in the world is a lot of fun. It displays character toys from those places. The section on North Korean animation was interesting, especially the way in which some animation is co-produced there. Unfortunately, the exhibits are written mostly in Korean, so if you can't read Korean, you might not get as much out of it. Fortunately, animation is visual in nature, so you can understand most of what's going on. If you live in Korea, this is worth the visit. Even if you don't like the museum, Chuncheon is a beautiful natural city and there is a peaceful view of Lake Hyeonamni behind the museum. You can also check out the crazy art pieces made of reused junk scattered around the museum. My favorite is a Chinese style dragon made of tires. The museum sits between two animation studios. Across the street is a restuarant (or cafe?) called Sketchbook. Maybe I'll investigate and report about this later. 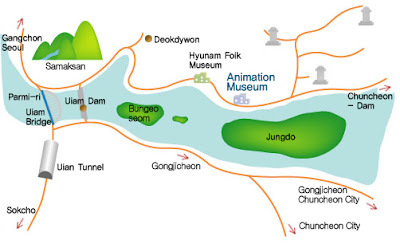 For more information, you can visit the museum's website which is: http://www.animationmuseum.com/ or the Chuncheon City website. I didn't know you went Chuncheon for all these cool stuff. Can't wait to see next post! Hey, thanks! It was a lot of fun!